The green machine is back, and this time, he wants revenge. Click here to play! Join the Incredible Hulk in his latest adventure into the realm of online slot machines and earn yourself some incredible cash jackpots. Just don't make him angry; you wouldn't like to see him when he's angry. Hulk: Ultimate Revenge is a great 5-reel slot machine played across 25 paylines, with the more lines activated multiplying your payout odds. The Hulk symbol pays out up to 5000 times your initial wager, as well as acting as a substitute for any other symbol in the game besides Scatters. Explosions are Scattered and will send you straight to the Bonus Round when three or more are found in a single spin. Once inside the Bonus Round you can win free games and multipliers! The Incredible Hulk is waiting for you to join his crew and win a stack of cash, so what are you waiting for! The Explosion symbol is Scattered and can earn you up to 100 times your wager, as well as send you to the Bonus Round when three or more appear after one spin. 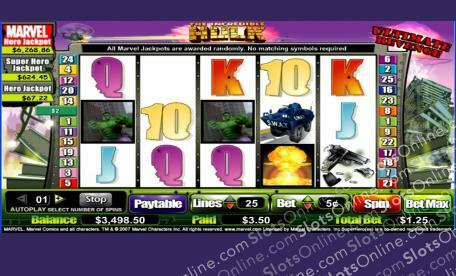 The Hulk can become any other symbol across the reels except for Scatters, and pays out at 5000:1 odds. The Bonus Round appears when you spin up three or more Scatters in one go. Once inside, you can win yourself free games and multipliers.